In some cases, the security admin may not have resource permissions to provision WAF from Azure Security Center or the application owner has already configured WAF as part of the app deployment. To accommodate these scenarios, we are pleased to announce that Security Center will soon automatically discover WAF instances in the subscription that were not provisioned using Security Center. 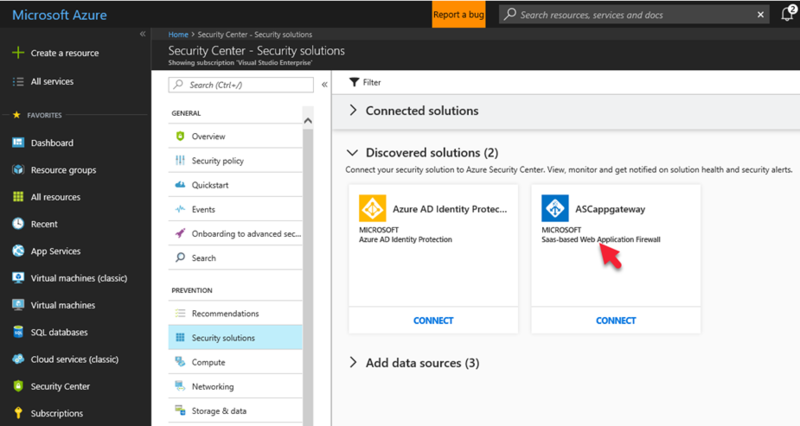 Previously provisioned WAF instances will be displayed in Security Center security solutions pane under discovered solutions where the security admin can integrate them with Azure Security Center. Connecting existing Microsoft WAF deployments will allow customers to take advantage of Security Center detections regardless of how WAF was provisioned. Additional configuration settings such as custom firewall rules sets are available in the WAF console which is linked directly from Security Center. This article on configuring Microsoft WAF can provide more guidance on provisioning process.